Foreign investors poured $182 billion into Latin America and the Caribbean in 2013. Central America, South America, and the Caribbean promise economic opportunities in a number of industries from extraction to automotive manufacturing to agriculture. And an emerging middle class stands to capture the attention of consumer brands from every sector. From 50,000 feet, Latin America looks like an investor’s playground, but it’s in the absence of a deep dive that interested parties find themselves hacked, sabotaged, or played. The environment is one in which opportunity and potential are counterbalanced by corruption and crime. For more than three decades, global business advisory firm FTI Consulting has been helping businesses assess and mitigate the risks of doing business around the globe. In Miami, Arnold Castillo leads the Latin American team as it investigates, strategizes, and partners with businesses to ensure their operations run safely and efficiently. Castillo grew up in Peru, cut his teeth in the Lima Stock Exchange (BVL), and facilitated the privatization of the country’s national railroad. Having also worked at top risk consulting and management firm Kroll, Castillo leads regional services from Miami with an insider’s knowledge. Despite its 32-year history and 18 years as the only publicly traded risk consultancy firm, Castillo says only in the last decade have businesses started to use FTI Consulting’s services proactively. Much of the work he does is still reactionary—after the firewall has been breached or the assets lost. For example, a party invested in extraction activities may require construction operations quoted at the outset at $1 billion but, due to collusion, could face a $4 billion completion cost. And even if operations appear smooth on the outside, if trafficking groups become unknowingly involved or illegal business practices are employed to get the job done, the investing party’s hands come out just as red. Foreign investors are rightfully hesitant to trust local resources, especially where trade secrets and business-critical information are involved. “Local resources, especially in very small markets, may switch loyalties or work for competing companies,” says Castillo. 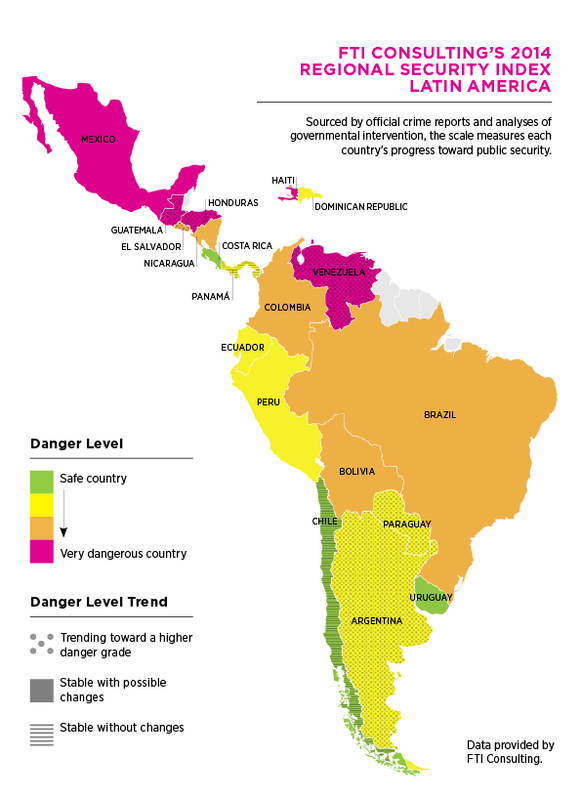 FOR THE FIRST TIME IN A DECADE, SOME COUNTRIES IN LATIN AMERICA ARE TRENDING TOWARD SAFETY AND STABILITY. BUT MANY OF THE DANGERS ARE NOT GOING AWAY, THEY’RE JUST MOVING. FTI Consulting excels in understanding the nuances of the market, including those that can be damaging to business. Using open source records and discreet source inquiries, Castillo and his team peel back the layers of topical due diligence to find issues that a remote investor can miss. With an extensive network of investigative journalists, forensic accountants, and former FBI, CIA, and police agents, the firm offers the best of both worlds: local immersion and trusted integrity. In Peru, for example, security in the larger cities has declined in the last year, creating a need for crisis management, but the Peruvian government lacks the efficiency to deploy resources. Even in some regions of the country that receive significant royalties from mining operations, funds are not directed toward improving security, infrastructure, or the cultural problems that feed crime and extortion, says Castillo. They end up in networks of local corruption schemes. Similar problems persist in Ecuador, Bolivia, Colombia, Venezuela, and the Dominican Republic. 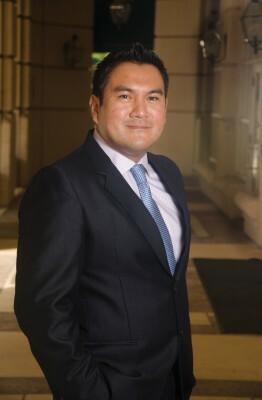 Castillo suggests foreign parties make security their responsibility and not leave it up to federal, state, or local authorities, which can be compromised by crime syndicates or internal corruption. “Most of our clients who rely on government support have lost faith in the system,” he continues. For those clients seeking to take security into their own hands, FTI Consulting strategizes to create rings of protection, beginning with security assessments, audits, and designs of surveillance and electronic security systems, followed by continuity and emergency planning as well as staff training, and rounded out with executive protection. In climates of instability, FTI Consulting is constantly improving its approach to personnel protection. The firm even offers clients and their families courses on prevention and negotiation in the case of abduction. Illegal activities are not the only impediments to business in the region. Latin America’s culture and history of activism make it conducive to social conflict, which, even when legal, can be disruptive. Communities opposed to a commercial presence can be stirred to action without proper communication, especially if a predator or toxic third party becomes involved and exacerbates tensions. In such cases, FTI Consulting will engage in social monitoring and develop a map of stakeholders. It is critical, says Castillo, to know whose interests are at stake in order to effectively relay the impact and the benefits of operations.